Discarded waders are not exactly filling up landfills; the total volume of breathable fabric thrown away each year is minimal next to the number of, oh, bottle caps, or rubber bands. But that doesn’t mean waders should simply be tossed when we’re done wearing them. After all, wader material is expensive; it’s water-proof, easily cut and sewn, and useful. Plus, nothing says ‘fly fisherman’ like beige breathable cloth. These were clearly some of the thoughts running through the heads of the guys who founded Recycled Waders, which sounds like the brainchild of a 23-year old Greenwich Village art student, but actually turns out to be pretty darn awesome. Here’s the deal: Recycled Waders collects old waders, and re-cuts the cloth to make new products. You can send in your own old waders and have products made out of them for a slight discount, or you can buy them off the shelf. 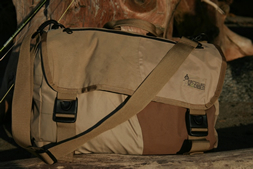 Personally, I have been carrying one of Recycled Waders’ Messenger Creels ($60) for the last year. I really, really like it. Aside from being made of breathable material, it’s perfectly sized, very well constructed with excellent clips and comfortable straps, and it’s more or less still waterproof in the rain. I often tote a full-sized Nikon DSLR with a couple lenses and a notebook around events I am sent to cover (such as Troutfest in the Smokies). I can’t say enough good things about my experience with the bag. 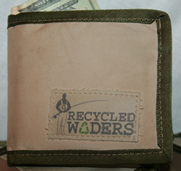 Recycled Waders also has a wallet ($20), a “Nook Sack” (a small fishing pouch–not a man purse!) ($30) and a standard fanny pack ($45). Personally I’d like to see a belt, a laptop cover (with sealed seams! ), and some kind of cinchable shield for cameras in the rain. Got any ideas for the guys at Recycled Waders? Let us know in the Comments section!